My progress on the wood pantry cupboard continues....slowly....but it is continuing. Thankfully, I have finally finished staining the piece. I would have to say that staining wood is probably one of my least favorite things to do. I'm alright doing flat, horizontal pieces, but there are a lot of corners and vertical sections of wood in this cupboard, not to mention the undersides of the two shelves that could not come out. But it is done, and I will now move on to the painting portion of the project. Yeah!!! Last week I showed you the first step in my process of transforming the piece, conditioning the bare wood. 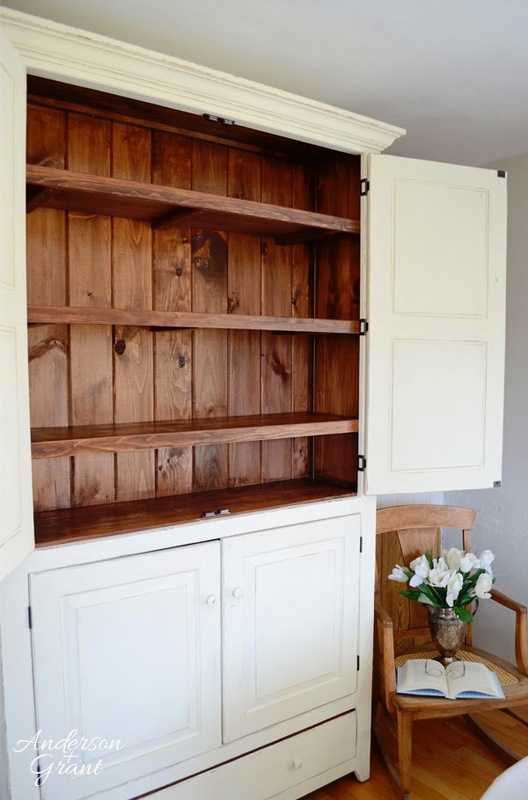 Today I would like to share some tips with you about staining wood. 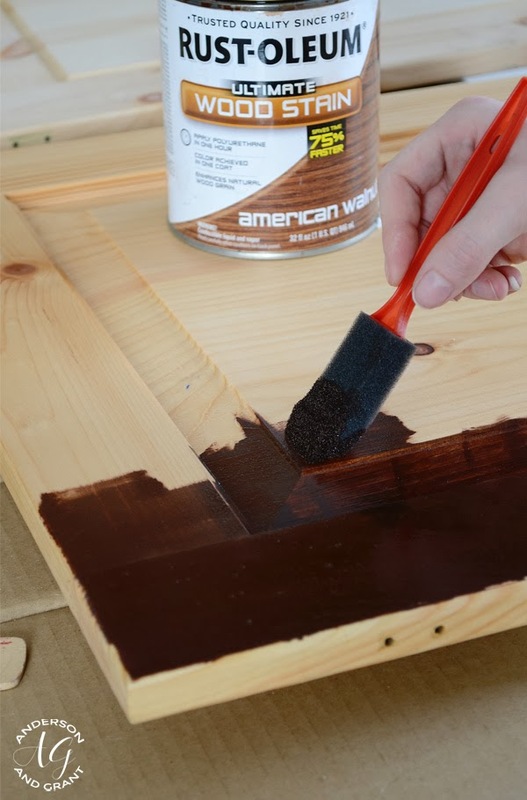 Before starting your project, you'll need to decide whether to use an oil-based or water-based stain. Oil based stains take longer to dry, so you'll have more time to work with it on bigger projects like floors or doors. It does have an odor, though. Water based stains do not have an odor and have a fast drying time. I used Rustoleum's Ultimate Wood Stain in American Walnut. It is oil based, but actually dries pretty quickly. Whichever you choose, just be sure to stick with that choice for your pre-stain and polyurethane as well to ensure a nice finish. 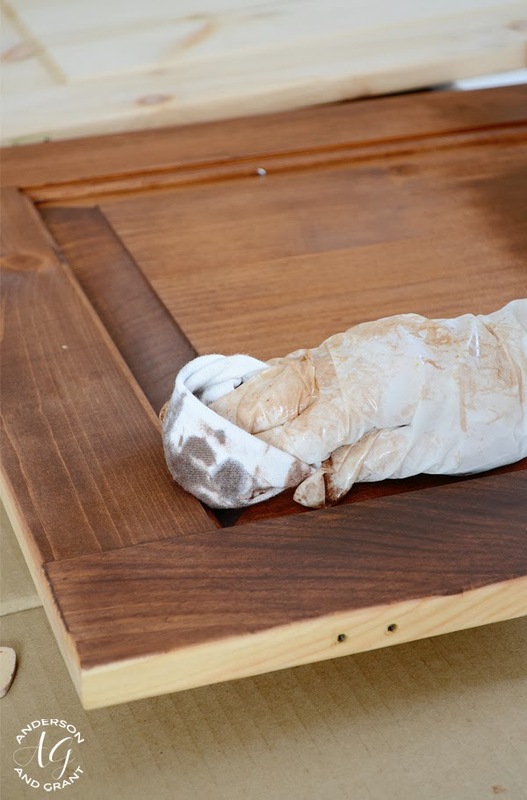 Staining is a messy project and, if you are using oil based stain as I have been, stain can be impossible to remove from your clothes and hands. Make sure that you have plenty of latex gloves to wear to keep the stain off of your skin. I have a horrible habit of ripping the tips of the fingers off of my gloves (and not realizing it until my fingers are already covered in stain! ), so I actually wore a DOUBLE layer of gloves on my hands. And I'm happy to say that while I did rip off the finger tips of my gloves, I was protected by the second glove until I put some fresh ones on. The can of stain says to shake or stir the stain before beginning. 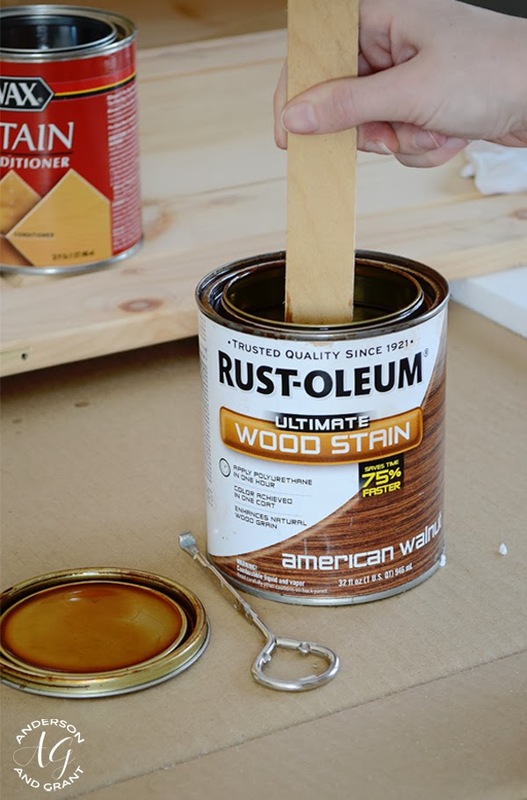 Make sure that you STIR the stain.....shaking does not mix up the pigment (what gives the stain its color) that has settled at the bottom of the can. It needs to be stirred so that the color is fully mixed in. I used foam brushes to brush on the stain so that I could throw them away without having to do any clean up (Have I mentioned I hate the clean up portion of projects?) On a project this large, I used numerous foam brushes because they don't hold up very long. You will need to have some clean, lint free cloths to wipe off the stain. I like to use old tee shirts. As one rag gets soaked in the stain, throw it away and begin using another one. 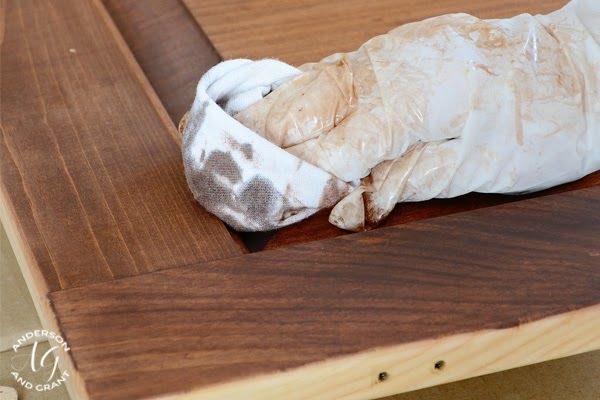 A wet rag will not properly wipe the stain away from the wood. While it doesn't make a difference which direction you brush stain on, you have to be sure that you wipe it OFF in the direction of the grain of the wood. The longer you leave the stain on the wood, the darker it will get. While applying a thick coat of stain seems like it would give you a darker color, it really just makes removing the stain harder. It can also leave your finish a little sticky. 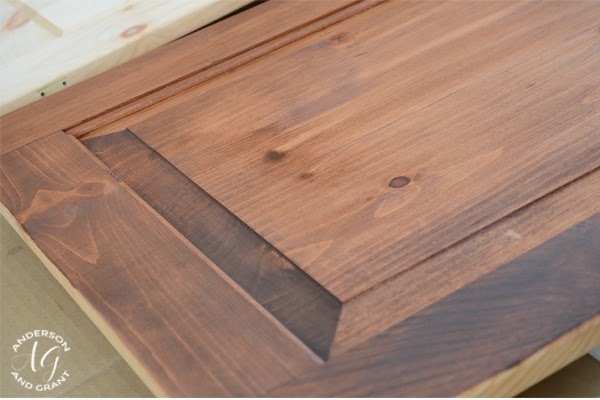 You are better off to stain the piece, let it dry, and then add another coat if you are looking for a darker wood tone. 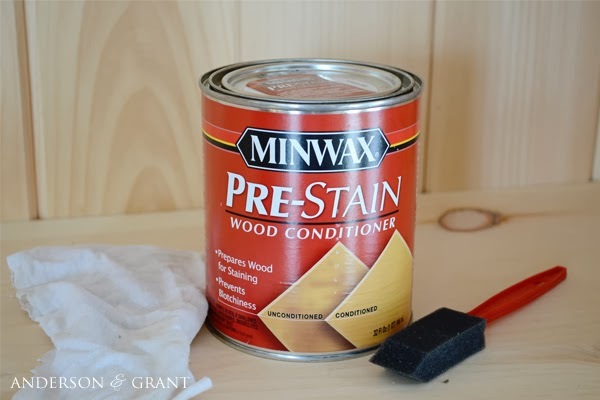 After your stain has dried (according to the directions on your can), you'll need to apply polyurethane to protect the wood. As for my pantry cupboard, now that the staining is done, I'll be moving on to the painting and distressing stage of the process. I'm really hoping that by next week you'll be able to see the finished cupboard. One can dream!! What about you? Any projects you'd like to start (or finish?!?!) in the upcoming week?